Last Tuesday, as I watched Extreme Weight Loss in my hotel room, I literally sat with my stop watch to time the length of commercials and doing workouts during them to come up with the workout below. I mean, let’s be real – you can use this watching ANY show, but if you finish the whole thing, I promise you’ll feel a little extra good at the end of the night! Also, while I was working on this little project, I saw that Heidi Powell posted about jogging in place during every commercial. We were totally on the same wavelength! 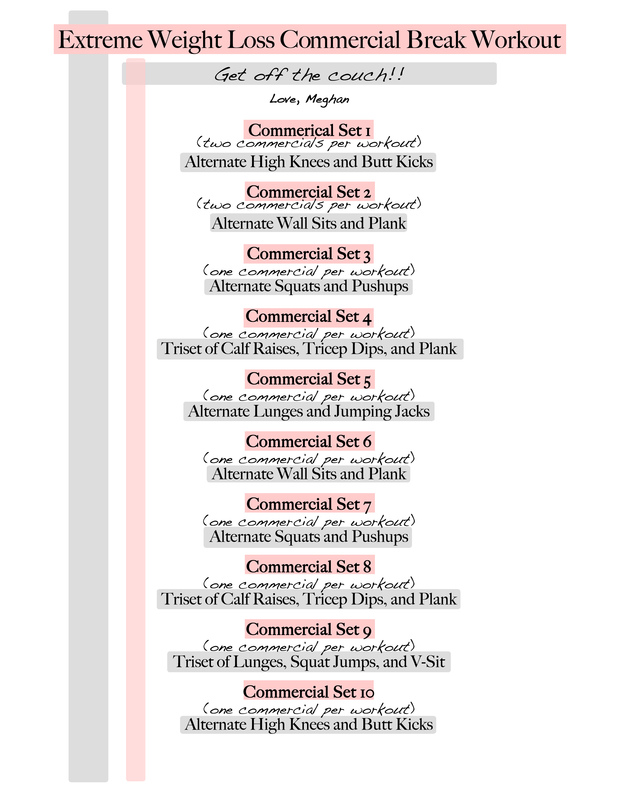 Each commercial break, do the exercises listed (either two or three), and whenever a new commercial starts, switch. You’ll see that the first two commercial segments say “two commercials per workout” because I noticed that those two sets have many shorter commercials, and later in the show, the individual ads get longer. You won’t end up doing everything for exactly the same time, but it gets you moving and strengthening! So here you go: EWL Commercial Break Workout, no equipment needed.